The strong tropical wave south of Jamaica does not officially have a closed circulation as noted by the latest hurricane hunter recon. Satellite imagery shows very cold cloud tops, indicitive of heavy rain. The rain extends from western Cuba, across Jamaica, to several hundred miles south of Jamaica. The heaviest rain noted was on the south coast of Jamaica and a few hundred miles south, where it looks like a center of circulation is organizing. This tropical wave is producing 40-45 mph winds and would have been named Dolly if the recon could have closed off the center. It is quite likely that this will become a tropical storm tonight or maybe tomorrow morning. Forecast models take this system to near the Belize/Mexican coastline by Sunday night. Keep in mind the effects will proceed the actual center moving inland. Rain squalls will pick up over night in the Cayman Islands and progressing toward the Yucatan during Sunday. It is possible if the tropical wave develops into a storm before landfall, it may regenerate in the Bay of Campeche early next week. Interests in the western Gulf should follow the progress of this tropical wave. Last edited by Caribbean Traveler on Sun Jul 20, 2008 2:36 pm, edited 1 time in total. 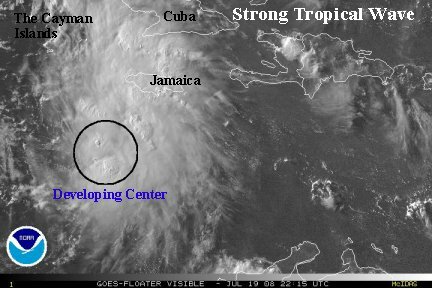 The tropical wave has continued to become concentrated a couple of hundred miles southwest of Jamaica. The next scheduled hurricane hunter aircraft is due later this morning. It is difficult to tell if a closed circulation has developed by just looking at the I.R. satellite imagery. Quickscat satellite did not show a closed low on the last pass. It is possible that the wind estimates were not that accurate under the deep convection though. 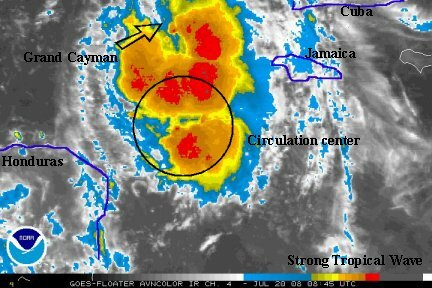 By our estimates, this tropical wave is probably on the verge of being a tropical storm. Some wind gusts are still probably in the 40-50 mph range under the deepest convection. We'll know for sure with the next recon if this is Dolly or not. The Hurricane Hunters apparently found a closed low of 1011 mb. With this being the case, it will probably be upgraded to depression status at the 11 am advisory. Again, it is probably very close to being a storm. The next update will be around midday. Well, NHC did not upgrade to a depression at 11 am edt..... A recon will be investigating later today, so that's what they're waiting for. It's funny to note that another government agency has listed "the disturbance" as Dolly on the satellite imagery - oooops! The earlier recon placed the low center very far to the south with the heaviest convection on the north side of the circulation from west of Jamaica to western Cuba. Convection is expanding and it looks like the Mexican Yucatan as well as Cancun/Cozumel southward into Belize should get soaked pretty good starting late today through Monday. Any cruise ships in the area will probably be in the midst of some pretty nasty weather! (Dolly) is forecast to move into the east coast of Mexico, south of Cozumel and move into the Yucatan by late tonight. It may reemerge and take another shot at strengthening before its second landfall south of the Texas/Mexico border several days from now. NHC has finally upgraded the tropical wave directly to tropical storm Dolly after the last recon. Top sustained winds are 45 mph. 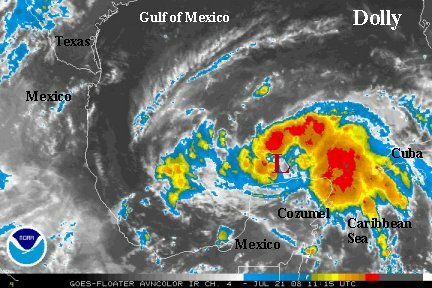 Dolly is likely to strengthen some before landfall late tonight on the Yucatan peninsula. Restrengthening in the western Gulf will mostly be determined on how much the Yucatan disturbs the circulation. It is likely to strengthen before the second landfall just south of the Texas border. We can't rule out the possibility that it will become a hurricane before the second landfall. The low center on the recon fix needs to be watched closely. It appears that there is a mid level rotation farther north. If the surface low is weak, it's possible that the main center may reform farther north. It doesn't happen often, but this may be one of those cases. If it does reform farther north, then the center will cross near or north of Cozumel resulting in less time over the Yucatan and less weakening. We should know by the next six hours. Dolly continues to organize today. It does appear that Dolly's center is reorganizing farther north. 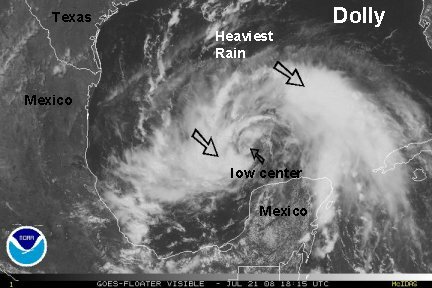 If this indeed the case, the low center may pass over or north of Cozumel late tonight or early tomorrow morning. Most of the models continue to hold onto a landfall position south of Cozumel. We will be watching closely the landfall location into this evening. The farther north the center moves, the better chance it will become a hurricane due to the lesser effects from land. After studying satellite imagery and additional recon reports it appears that our previous update had Dolly's surface position just a bit too much north. The surface low is on the edge of the convection with a mid level circulation farther north. This is usually indicative of a system that is still trying to develop or is being sheared. Recent I.R. satellite imagery shows extremely cold cloud tops of about -75 degrees celsius. More importantly, an outflow pattern is beginning to take shape. This means that a more favorable enviroment is developing aloft. 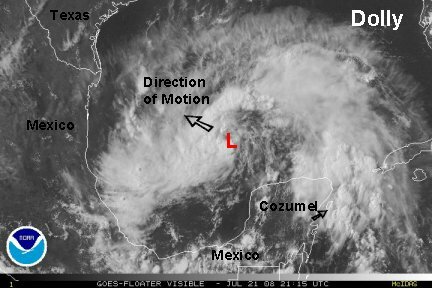 An upper air low hampered development for the past few days, but now is rotating south toward Guatemala and "is getting out of the way". Dolly will make landfall later tonight south of Cozumel. The worst effects though will be north of the center on the northern coast of the Yucatan into the Yucatan channel. Seas were measured up to 16 feet from a buoy in the northwestern Caribbean. Seas could be up to 20 feet. A rough ride for cruise ships or other boating in the area. Forecast models suggest Dolly will pass over the Yucatan and restrengthen....likely into a hurricane. Interests in the western Gulf should pay close attention to the progress of Dolly. Landfall should be near the Texas/Mexico border about Wednesday. It appears that NHC has now changed their forecast and have relocated Dolly farther north. The 5 am NHC advisory detailed the same dilemma that we were discussing 12 hours ago. Apparently the surface low is very weak and they have decided to go with the stronger mid level rotation now. We had placed the low a bit father north yesterday evening, but decided to move it a little south after successive recon fixes placed it south. It is usually wise to go with the recon fix. This time though, the surface low was very weak and was / will not be the main player. 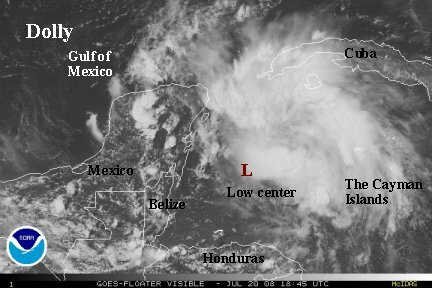 What does this mean It means that the weak surface low probably dissipated south of Cozumel and the mid level low passed on the north side of Cozumel. The mid level center in now off of the north central Yucatan peninsula already. 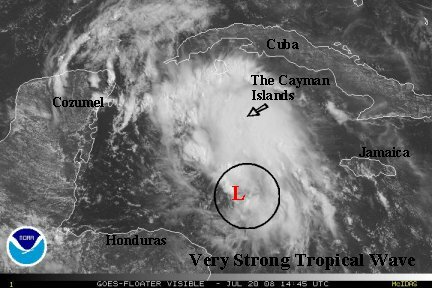 It is quite likely that this will be the main low center that develops. This change in position will also effect the forecast models. A farther north track is now more likely with a landfall in south Texas. We had mentioned a couple of days ago that the models may not be that accurate to due the fact that they didn't know where the surface low center was really located. Now that they do, the forecast track should be better. Seas will start to calm down in the northwest Caribbean sea now that Dolly is moving away. The buoy that measured 16 feet last evening in the northwest Caribbean is now down to 9 feet. The seas in the western Gulf should continue to build over the next few days. The height will be partly determined on Dolly's intensity, in which we think hurricane status is a good bet. 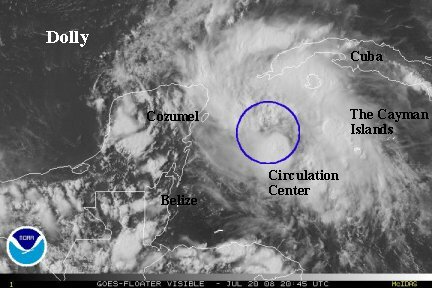 Dolly's center of circulation is now clearly seen. The position is slightly north of NHC's official track. Dolly is not well organized yet. Little convection is near the center of circulation. The strongest winds are well east and west of the center of circulation in squalls. It is very possible that Dolly will become a hurricane before landfall early Wednesday. 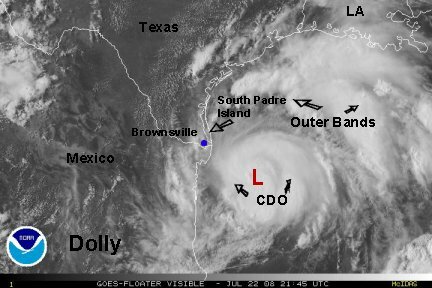 On its current path, Dolly would move into extreme south Texas. Some of the models push Dolly a little more west-southwest just before landfall into extreme northern Mexico. Interests in South Texas and northern Mexico should prepare for possible hurricane force winds Tuesday night into Wednesday. Dolly is slowly getting better organized with the convection starting to congregate near the center of circulation. The motion is just a bit southwest of the official NHC track. Models continue to bring Dolly inland near the Texas / Mexico border by early Wednesday. Rain squalls will be approaching south Texas and northern Mexico by tomorrow. Interests on the northern Mexico and south and central Texas coast should take action to protect property now. Dolly has been slowly organizing over the last several hours since the last update. Hurricane warnings are now up from Port O'Connor, TX southward to Rio San Fernando, MX. Top sustained winds of 50 mph looks reasonable. Dolly is moving west and is expected to slow down some Tuesday and turn slightly more northwest. Just before landfall early Wednesday, a high pressure ridge builds and may turn Dolly west again near the Texas / Mexico border. Radar shows some outer rain bands offshore. Expect wind and rain to pick up later Tuesday and especially Tuesday night. At this time it does appear that Dolly will become a minimal hurricane before landfall. 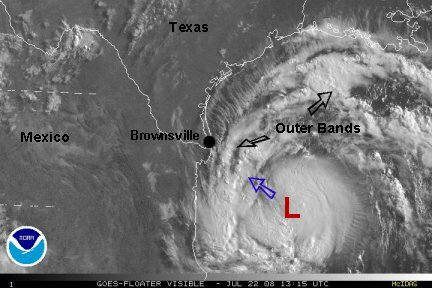 Dolly is about 235 miles southeast of Brownsville, TX. Hurricane warnings are up from Rio San Fernando, MX northward to Port O'Connor, TX. See the official NHC advisory for a complete list of watches and warnings. Dolly is still on track to make landfall near the Texas / Mexico border tomorrow morning. Keep in mind that effects from Dolly, such as increasing surf and rain squalls will start to pick up today. Interests in south Texas and northeastern Mexico should finish preparations by later this afternoon. The NOAA recon earlier found a ragged eyewall and had a top flight level wind and surface wind estimate of about 58/59 knots. NHC's 65 mph top sustained winds are probably close. We expect Dolly to continue to strengthen and become a minimal hurricane before landfall. Seas are up to 20 feet in the south central Gulf of Mexico. A storm surge of 4-6 feet, not including wave increase will be seen near and north of the landfall position. At this time, south Texas to the Mexican border looks to get the maximum storm tide increase. Wow! 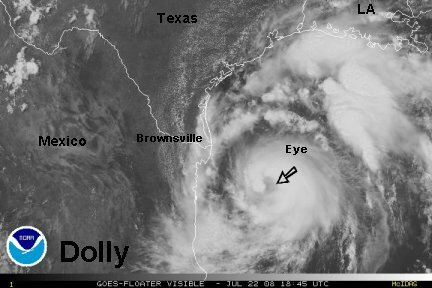 Dolly's eye is now rapidly forming and is clearly seen on the satellite imagery. Top sustained winds are 70 mph from the last NHC advisory. This looks reasonable. With the recent development of the eye, look for Dolly to be upgraded to hurricane at the 5 pm edt advisory time. Dolly continues on its course to take it to the Mexican / Texas border tomorrow morning. The effects will really start to pick up over night in this region. 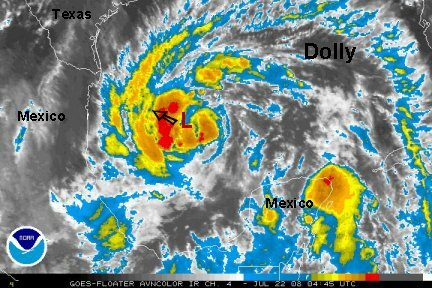 Northeastern Mexico and south Texas will get the worst of Dolly. Right now we still think a cat 1 hurricane, but can't rule out cat 2 with the recent eye wall development. Landfall will stop any additional development in about 18 hours. 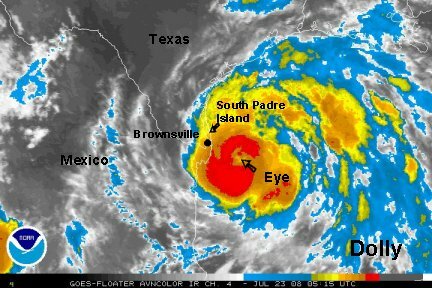 The highest storm tide looks to be in the South Padre area at this time where winds will be blowing onshore. Storm tides could be in excess of 6 feet in this area. Dolly was upgraded to a hurricane of 75 mph on the 5 pm edt advisory. It is only about 135 miles southeast of Brownsville, TX at this time. Even though the eye has clouded over, a very good representation can be seen on radar. Heavy rain associated with the CDO (central dense overcast) is less than 100 miles away and will reach the coast later tonight. 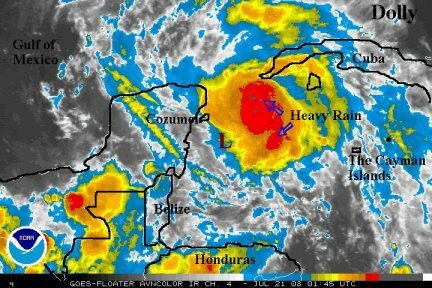 Heavy rain in excess on 10 inches is likely in the vicinity of where Dolly makes landfall. Dolly will come ashore Wednesday morning. As mentioned earlier, the largest storm tide will be near and north of landfall.....South Padre Island and extreme northeast Mexico. Dolly ready to move inland by midday.... Hurricane Dolly has slowed down considerably with top sustained winds of 80 mph as of the last advisory. This is probably a touch too high, but slow strengthening is still occuring. The last recon recently measured a top surface wind of 69 knots. The satellite still shows that the eye is covered in high cloud, but the radar representation is very good. The rain associated with the CDO is just about to move inland near the Texas and Mexico border. Look for a steady heavy rain to begin. A few tornadoes were sighted not long ago with the outer bands near Brownsville. The highest surge still looks to be near the Texas and Mexico border northward to South Padre Island. Seas to 22 feet have been measured offshore.